99.000.- isk all equitment and online course included. You can add the drysuit course to your open water course for addit ional cost of 20.000.- isk and you get one more dive also. 79.000.- iskFor those who like to extend the knowledge and skills in diving. The SDI Advanced Adventure course will give you an overview of five different SDI specialties. The SDI Advanced Scuba Diver Development Program was created to make truly “Advanced Divers.” During the course your Instructor will take you through four complete SDI specialty courses (for example; Deep, Navigation, Photo, Video) covering all the skills and subjects, so that by the end you will feel comfortable to conduct dives of a similar nature.Once you have logged your 25th dive (these can include any and all training dives), visit your local SDI facility with your logbook and verification of completing four SDI specialties and you will be awarded the SDI Advanced Scuba Diver certification. 79.000.- isk. You will learn skills such as how to perform self rescues, buddy rescues, recognize and calm potential panic divers, administer proper first aid to divers that have experienced dive related injuries, conduct effective search patterns and manage accident scenes. After the SDI Rescue Diver Course you can enroll in the SDI Master Scuba Diver Development Program or start in the professional ranks and sign up for the SDI Divemaster Course. 90.000.- isk. 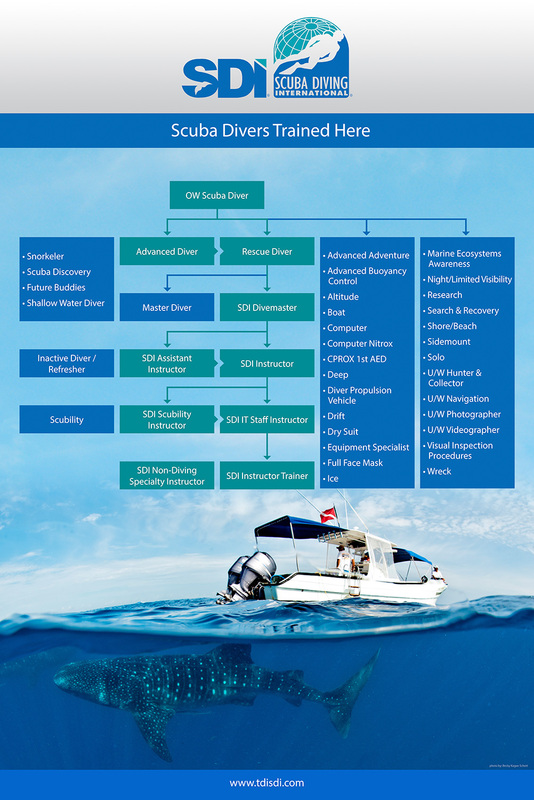 The SDI Divemaster Course is the first professional level certification. During the course you will learn how to work with divers, lead certified divers, and act as a dive guide showing divers underwater dive sites and the marine life that inhabits those dives sites. You will increase your knowledge about physics and physiology as well as increase your proficiency with your scuba and snorkeling skills. Please send us an e-mail for more infromation. 49.000.- Learn how to dive in a drysuit. If you have never dived in cold water in a dry suit then this course is good idea. Drysuits can be hard for those who have never used them and in this course you get the change to familiarize yourself to them in suitable environment. One confined water dive and two dives in open water. 69.000.- isk. Many interesting sights lay just beyond open water diver training limits such as: beautiful wall dives, shipwrecks, and critters that don’t come into the shallows.The purpose of this course is to provide the necessary training to plan and execute dives that are beyond the depth range experienced during an SDI Open Water Scuba Diver course, specifically beyond 18 metres/60 feet and to a maximum depth of not greater than 40 metres/130 feet. By the end of the course your knowledge, awareness, and comfort level with deep diving activities will have increased. This course is four dives, and is done in two days. Diver will learn to use and setup a redundant air supply necessary when diving deep. Divers need to have their own equitment but we can lend student extra tank and regulator for this course. 59.000.- isk. Duration two days. Indoor workshop, pool dive and one setup dive then two training dives. 29.000.- Nitrox or enriched air. This course trains divers in using nitrox mixtures from 22 to 40 percent oxygen.